Achilles tendon bursitis, also known as Retrocalcaneal bursitis is common foot pain in athletes, particularly runners. It can often be mistaken for Achilles tendonitis or can also occur in conjunction with Achilles tendonitis. With tendon bursitis, the bursa (which helps tendons move over bones) becomes inflamed, normally from overuse. This can cause tenderness and swelling at the heel. Symptoms include pain at the back of the heel, especially when running uphill or on soft surfaces. There will be tenderness and swelling at the back of the heel which may make it difficult to wear certain shoes. When pressing in with the fingers on both sides at the back of the heel a spongy resistance may be felt. A bursa is a small sack of fluid that sits between a tendon and a bone to help the tendon move smoothly over the bone. 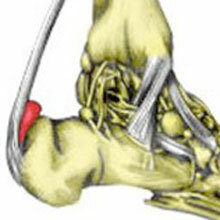 The retrocalcaneal bursa is situated in the feet between the Achilles tendon and the calcaneus or heel bone. With repeated trauma, the bursa can become inflamed. Achilles tendon bursitis is often mistaken for Achilles tendinitis. It is possible for the athlete to have both Achilles tendinitis and Achilles tendon bursitis at the same time which is known as Haglund’s syndrome. Rest and apply cold therapy or ice. Ice should not be applied directly to the skin as it may cause ice burns but wrap in a wet tea towel. Commercially available hot and cold packs are often more convenient than using ice. Taping the bursa with a donut shaped pad to take some of the pressure from footwear may help. A doctor may prescribe anti-inflammatory medication e.g. ibuprofen to reduce the pain and inflammation. Applying electrotherapy such as ultrasound may reduce inflammation and swelling. A steroid injection followed by 48 hours rest may be given for persistent cases. If the bursitis is particularly bad and does not respond to conservative treatment then surgery is also an option. See rehabilitation for more detailed information. Rehabilitation of Achilles bursitis or retrocalcaneal bursitis is based on reducing pain and inflammation, identifying possible causes and gradually returning to full fitness. The guidelines below are for information purposes only. We recommend seeking professional advice before attempting any rehabilitation. Stage 1 is to reduce pain and inflammation. Stage 2 involves identifying and eliminating the causes of bursitis. Stage 3 restores flexibility and strength to enable a return to full fitness. This involves rest from activities that aggravate it. If running makes it worse then refrain from running until such time as pain allows. You may be able to swim or cycle. It is important to try to maintain some kind of fitness. This stage may take anything from a couple of days to a couple of weeks. Wear shoes without backs to them which can relieve the pressure on the heel. A foam ring cut to fit around the bursa to protect it from rubbing on the shoe may take the pressure off the bursa and allow it to heal faster. NSAID or Nonsteroidal Anti-inflammatory drugs (e.g. Ibuprofen) may be prescribed to help reduce the inflammation. You should check with a Doctor before taking any medication. Ibuprofen should not be taken by anyone with asthma. Apply cold to the site of pain. This will help to reduce the inflammation. Ice can be applied although not directly onto the skin – wrap in a wet tea towel. Ice can be applied for 10 to 15 minutes every two hours depending on the severity of pain and time available. You should aim to apply cold therapy three times a day at least. When the initial pain and inflammation has died down, progress to stage 2. Common causes of Achilles injuries include tight calf muscles and overpronation. Both of these are easily correctable. Insoles can be worn in the shoes to reduce overpronation, placing less strain on the tendon. Wearing the correct running shoes is also very important. If unsure, visit a podiatrist, or a specialist running shop for a gait analysis. Stretching the calf muscles should be performed regularly, every day, in order to increase their flexibility. Both the Gastrocnemius and the Soleus muscles need stretching. When pain has gone, slowly build back to your original level of exercise. Aim to start back at 50% of your original workload, although this may be less depending on your fitness and the amount of time you have spent resting. It is important to remove any irritation to the bursa. Check that the shoes are not rubbing on the bursa or cut away any material that might cause irritation of the bursa. If you have looked after yourself you should be back to full training within two to three weeks. Be patient and allow about a week of active rest for the bursa. The following is a basic guideline for returning to training. This will vary depending on previous fitness and the extent of the injury. Continue this gradual progression until you can confidently run and resume normal training. The calf muscles consist of the larger gastrocnemius muscle and the lower soleus muscle. If these muscles are more flexible then they will put less train on the bursa at the back of the heel. Stretching should only be done if it can be done pain-free. The guidelines below are for information purposes only. We recommend seeking professional advice before attempting any rehabilitation. If gentle pressure is applied to the foot, and an angle of 90 degrees should be possible without needing to force it. The Soleus muscle is tested in the same way but with the knee bent. By bending the knee, the larger gastrocnemius muscle is shortened, leaving the soleus which attaches below the knee to be stretched. It is rare that the soleus muscle will be tight, however tight gastrocnemius muscles are more common.